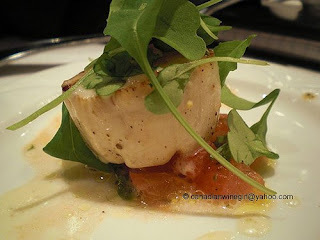 Dinner was a very typical spring/summer fare for us. Yams. MMMMM I lurve my yams. The most nutritious food next to the red pepper. Toss all of the above. Salt to taste. That easy and that tasty. 4-5 minutes a side and feel free to rebaste after the first turn. Par- cook the yams in the microwave for 4 min/piece or steam for 10-15. Put them on the BBQ as you're heating it up. You'll need about 20 minutes. Fork tender. ie. you can jab it and it doesn't feel like an apple. Serve with low fat sour cream and chives. Dona Paula Los Cardos Chardonnay. I spent so much time earlier trying to sort out the widget that I don't have time to load the recipes for dinner or D will kill me. We're having strawberry pie with Soya Ice Cream for dessert now.... he's on the phone while I type this in ;-D I'll finish tomorrow. Dinner was BBQ'd 'Curry' pizza a la Zante's in San Francisco. The left over half of the dough is large enough to make two 12" pizza's. Roll out thin and place on a pizza peel to carry to the BBQ. Don't over load because it will not be on there for very long. Do not turn the BBQ on too high or you will have charcoal. Sauce is plain red sauce or tomato puree, about 1/2 c per pizza with 1 T of curry paste. Mix well. The curry paste is a concentrate and you don't want to get hit with too much. I am a big fan of pre grated cheese if you're making a few pizzas unless you're making a marguerita and need fresh mozzarella. No subbing! I used a cheddar nacho saputo grated mix. Spread the sauce out thinly. You're coating like a first coat of paint not spackling on a thick layer. Sprinkle a small handful of cheese. Cauliflour chopped, chopped spinach (fresh or defrosted frozen) and onion. Chopped spinach, red onion sliced, sundried tomatoes chopped, loin of tuna (in a foil pack, chunked tuna will do in a pinch but not flaked please), and marinated eggplant strips. Place on BBQ on indirect heat until cheese is melted. ~5 minutes. 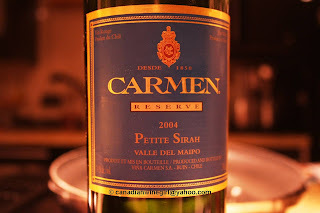 We drank a Carmen Reserve Petit Syrah. We had guests over. It seemed like a good idea when we invited them for a Friday night. No big right? We have plans for Saturday and we haven't seen them for a while and it's hard to get a good time as they have kids and we're all over the place. So when they offered up Friday, we offered to cook. Well, realising Thursday night that we both have day jobs and hadn't bought any groceries and they're coming over 2 hrs after the earliest we could possible get home. Actually, about the time we normally get home... well we were freaking. Thankfully D was thinking ahead and when he set aside three bottles I thought they were all for dinner. I was wrong, gleefully. One was for while we were cooking. That made things seem far less pressed for time. Starter 1 was a Lime and Cilantro Hummous Dip we bought at the farmer's market from the Bean Guy. Which I guess, if we'd planned better we could have made but it worked out because we always make too many appetisers. Starter 2 I made, sort of winging it because I couldn't find the recipe I wanted and was getting frustrated while searching for it amongst pasta sauces and vinagrettes. Load everything into a food process except the olive oil. Pulse until the texture of salsa. Then start on a steady chop and drizzle in olive oil until you get the consistency you want. If you're using a smaller machine pour in the oil about a 1T at a time and puree in. Serve with crackers or bread. Add cracked black pepper but don't add salt. The capers, olives and anchovie paste is enough. BBQ or Broiler or Gas Stove Top all work. Whichever you're using turn it on high. 1. place pepper on BBQ, or directly on gas element or on a pan directly under broiler. 2. turn as it cooks until it's charcoal BLACK. You're roasting off the skin. 4. they'll still be hot so becareful. use a cloth napkin, it's best but bare hands or paper (NON LINTY) towel. In the sink, rub off the black. It should have steamed off from sitting. Do not use water to rinse! 5.Cut open and de seed. They're ready for use. You can make dip like above, pasta sauce or serve in filet sized cuts as anti pasta with some olive oil and garlic. So good. Next course was Chilled Pea soupe with Ginger and Mint garnished with Sour Cream from Taste magazine. So simple and so tasty. You can really taste the freshness of the peas and the ginger. If you don't have time to chill you can serve it warm. Sauté onion, ginger and garlic in butter in a saucepan until softened. Do not brown. Add the stock peas and bring to a boil. Reduce heat and simmer covered for 5 minutes just to blend flavours. Stir in mint. Purée in a blender until smooth. Add salt and pepper to taste. Serve warm with a dollop of sour cream and chives or chill and serve cold. In a small saucepan, combine maple syrup, ginger, lemon, garlic, and soy sauce. Simmer and reduce to about 1 cup (about 30 minutes). Let cool. Using a clean cloth, rub the top of the plank with ½ cup of olive oil. Arrange the scallions on the surface of the plank. Preheat oven to 400°F.Place the salmon, skin side down, on the scallions. We BBQ'd and did not have a plank. We heated the BBQ up. Laid the scallions directly on the Grill. Placed the Salmon directly on the scallions on the grill and contined normally. Season the fish with sea salt and black pepper. Using a large brush baste the salmon. Roast for approximately 25 to 30 minutes until the fish is cooked through. During the cooking process, baste every ten minutes, and baste again just before serving. Serve on the plank. if you have one. We served at table on a nice little cutting board. The scallions were all carmelly and absorbed alot of the nice fat from the fish. Very good. 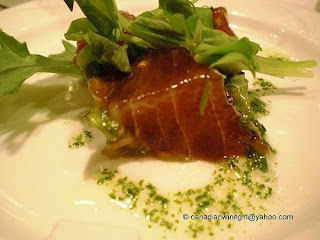 Even our more reserved guest reached over and grabbed the scallion left sitting on her husbands plate. Highly recommend you try the glaze at the least. 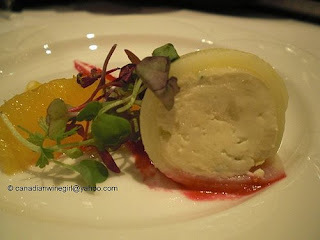 Here is a picture from the Chef's website because I didn't want to take too many photos with our guests here. I'll have to load the Dessert recipe later. I am burning the morning away. Dessert was a Vanilla Bean and Ginger Creme Brulee... YUP Ginger themed. SOOOOO GOOOOD and GOOOOOD for you. 2 cups whipping or heavy cream, sorry no low fat substitutes here. 4-5 large egg yolks, well we normally have 5 but we were short and it turned out okay. Preheat oven to 325°F. Place three 4-inch-diameter ramekins in a large roasting pan. Mix cream, sugar and ginger in heavy medium saucepan. Using small sharp knife, scrape seeds from vanilla bean. Add seeds and bean to saucepan. Stir over medium heat until sugar dissolves and mixture comes to simmer. Cover pan, reduce heat to very low and simmer gently 10 minutes to infuse flavors. Strain into large measuring cup. Whisk yolks in medium bowl until well blended. Gradually whisk in hot cream mixture just to blend. Return custard to measuring cup; divide among dishes. Pour enough hot water into pans to come halfway up sides of dishes. (This is called a Bain Marie. It helps cook things like cream evenly.) Carefully transfer pans to oven. Or pour whilst the pan is on a rack in the oven and pour the water in while it's in the oven. Bake custards until almost set in center when pans are gently shaken, about 30 minutes for fluted flan dishes and 35 minutes for ramekins. Using metal spatula, transfer custards in dishes to work surface; cool 30 minutes. Sprinkle 2 teaspoons sugar evenly over each custard. Working with 1 custard at a time, hold butane cooking torch so that flame is 2 inches above surface. Old the ramekin with the tips of your fingers, use the hand you're better with because you turn the dish while you hold the flame still in the same spot. Direct flame so that sugar melts and browns, about 2 minutes. Refrigerate until custards are firm again but topping is still brittle. Garnish crème brûlées with fruit. Sorry no photos. The recipe made six. We had four so I'll photo the last two when we have them. It is super sunny and warm today so I made a point of popping out for lunch. But no one is downtown so I took it away. I got the Lunch Special of 22 pieces of Sushi (Yam, Tuna, California) for 6$ and a BBQ Salmon Roll for 3$. The price is great but the box does not come with Miso or Salad. The yam roll is not very good. Even in my regular cheap place on Granville near Davie, it's made fresh. You can see the Yam has sat around. 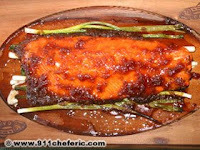 The BBQ Salmon is alright or at least the sauce on top is quite nice while it's fresh. It started to congeal pretty quick. The rice is mushy. I'm making Zuccini Thyme Quinoa to have with Sunchoke soup from last week. 3 on 7 Maples, maybe another half for comfort and fill. I would recommend. You get the take away in those cardboard boxes with the wire handle like in the movies. So kitch. Love it. Coffee and Scones from Choices market. ... four luscious looking buttermilk, apple and cinnamon crunch scones to be exact. MMMM. My Saturday morning photo does not do it justice. I thought it was rich and buttery but D thought they were a bit soggy even though we heated them in the oven instead of the microwave. I reckon it's because of the apples. Still nice change from cereal or yogurt :-D Planted trees, ferns, roses, flowers and grass at Jericho Beach. Planted some Columbines and grass with (or rather near) Mayor Gregor Robertson. Stopped to pick up some Expresso beans at 49th Parallel before lunch at the Noodle Box on 4th. They serve a variety of 'Asian styles' from Malaysian, Thai, Japanese, Chinese .... in large bowls heaped with sprouts, peanuts and cilantro regardless of which you order. The portions were decent. D thought they were average. I was working to finish mine. I had the Indonesian Spicy Peanut with Tofu and D had the Teriyaki Udon with Prawn. You can choose the heat rating. I chose third from worst, X Rated, though 3 higher than what they consider 'average'. D chose average and he thought it was a bit too spicy. I thought mine had it's pockets of heat but because of the peanut sauce which is creamy, didn't feel threatening. I thought the udon noodles were great but I thought the teriyaki was too sweet. D didn't. Course, I've never been a teriyaki fan. If I lived closer I'd probably be a regular. I'll add more later. D is outside planting the herbs we bought by himself. I feel bad. Prepare israeli couscous or rice as per package. Israeli couscous is so cool. The beads are the size of tapioca pearls. In the middle eastern shops you might mistake them for tapioca. I did. The package is all just arabic script and didn't know until I asked. The cooking time will depend on the size of the bead. Some are smaller. The ones that come in branded boxes in specialty grocers like Trader Joe's or Draeggers or Urban Fare or Meinhart's. They're more predictable to neophytes like me who didn't grow up making it. But I bought mine at a shop run by and meant for middle eastern clientele not aware that it was sold in those branded boxes. Truthfully, didn't want to pay those prices. Like risotto, best to taste for doness. About 1/3 c per person, double that in Water. Season with salt and pepper. I like to toss in olive oil to brown a bit. Then add the water and boil for 15 minutes then let sit covered. fluff with fork. 1/2 t favourite curry powder. FIRST, I recommend you chop all the veg. NEXT have the broth and coconut milk in a measuring cup ready. THIRD wash the fish and drain. Add 1/2 of the broth. (If' you've mixed the liquids then 1/4 of the liquid) cover and simmer for a couple of minutes only to soften the carrots. Don't bother with this if you don't mind the al dente carrots. I prefer them that way. Add the green beans and toss briefly. Add all the liquids, including the lime juice and the hot sauce. Add the fish carefully and gingerly shimmy it below the veg under the broth. Cover and simmer on medium for 3 - 5 minutes. 5 was fine for the fish to cook through with the thickness we had. On the way home from a Goorin sample sale, we stopped at a Vancouver landmark of sorts. On the corner of Venables and 1st. Pink awning and pink building side. You can't miss it. It has 218 flavours on site and is made locally. They have a building across the road with a little parking lot and tables. The cones must be purchased first and you're given a colour coded poker chip. 4$ single, 6$ double and 8$ triple. Watching the scooping, the single is the best deal. We both got doubles. Well, I got them for us because I dragged D to the sample sale. It's 2$ extra for a chocolate dipped waffle cone. The waffle cones are made right in the parlour. You're allowed to try whatever and D did! .... and a few more that escape me. I had a scoop of the Walnut and Pumpkin and Fig and Lemon Zest. D had a scoop of Chocolate Fudge and Basil Pernod. Sooo delicious and fresh. You can clearly taste in the flavours like ginger and basil that it is made from solid real ingredients. Families were streaming in and out with their kids and locals stopping in for the regular. Wonderful. Course now D's full so we're going to post pone the poached sole we planned. I offered to buy dinner but he said that wasn't the point :-D. So we'll have soup later. I'm making some Leek Quinoa to have with my soup. No boullion this time. Just pepper, 1/4 t salt and 1/2 c leek and 1/4 c quinoa. Soup, I'm going to have the Sunchoke and Leek from the other night. D is full from the below. We're having a bit of a Cheese Board while hanging out. Little Qualicum Cheese works blue and Ridge Crest Dairy fresh chive and garlic.